I didn't plan to be so last minute, but my character was a bit camera shy. My childhood was more in the early 90's but we had socialism, so a lot of the cool stuff from the 80's, like gaming consoles came late to this part of the world, even with the mixed Finnish /American/ Italian culture going on in my family. My fondest memories are riding around the neighborhood on a black BMX bike, cruising and scheming all the naughty things we could do today. It was a good time for the world of skating and alternative sports. We also had the coolest sneakers and music became mobile. A closer look at some of the props from the garage. It was an interesting scale to work in, it has its advantages and disadvantages. Somehow I never find minifigures challenging enough so I make my life complicated. Thanks for the unusual theme. Dein MOC ist grandios. In diesem Maßstab kann man richtig viele Details bauen und das ist dir hervorragend gelungen. Ich wüsste gar nicht, was mir am besten gefällt. Das BMX-Rad, der silberne Ghettoblaster, das Garagentor, der Wartezimmer-Stuhl und natürlich der Typ mit den Kopfhörern. Super! *Ich frage mich gerade, ob "unter aller Sau" sinngemäß übersetzt wird. No worries about the language, Brixe, automatic translate works ok most of the time. When you say waiting room chair, I know you must have had the same kind everywhere in the 80's. I think it was a Danish design copied by everyone. Wow! This is going to bei a perfect start Info the Contest year 2019! There are already so many cool MOCs it's going to bei really hard to choose a Winner! Love it that there are so many non-minifigure-scale entries. Your entry ist excellent...Love the many details, the Bike, the Chair, the Ghettoblaster, the T-Shirt. Jeep Up the good work! Ich schreibe auch mal deutsch, dachte das du ja eventuell auch einige Worte lernen möchtest. 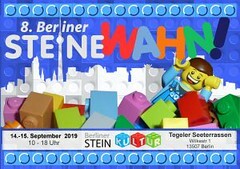 So geht es mir jedenfalls mit dem Englischen das ich hauptsächlich durch die Lego Community frisch halte. Ein richtig toller Beitrag! Wie schon bei Marion ist dein Beitrag sehr authentisch, auch wenn ich überrascht bin was die Haarfarbe angeht . Besonders genial finde ich das Mauerwerk, die Farben sind perfekt. Auch der Ghettoblaster, und all die anderen Gegenstände im "Franic-Scale" sind sehr gelungen. Für mich führst du hier fort, was du auf NewElementary schon länger auf sehr hohem Niveau ablieferst! A really nice and personal entry to the comp, I really dig the bmx handlebars, they are spot on ! your MOC is just amazing. The tubes fit perfect to built a BMX bike, the ghetto blaster looks very realistic with that much details on it. My favourite part of the building is the skull on the shirt and also the garage gate has a very cool look with the white windows. The other details are also insane. I guess i have favourite for the poll. Wow that's great. At first I wanted to build a bigger BMX bike for my entry, but that surely would not look as cool as yours. Great job and all the best for the contest. The second picture just blows it out of the water... Chair, lamp, radio,.. A great selection of 80s icons extremely well captured. And that garage scene just ties it together so well – nicely done with great textures everywhere! Thanks steentje i thought maybe non-minifigure scale might be less competitive, but I guess not. Marcel V. hehe, yes, I learn a new word every day. I am glad you think the New Elementary standard is maintained. thriangle. Because I wasn't sure if the bike would fit into a scene, an alternative idea was just to hang the handlebars on the wall as decoration. Tnx Niklas, the tubes can be tricky to connect, but thankfully there are plenty of black Technic pieces to work with. Thx Thomas, I am sure there are more ways to do it. Hey Markus, you are alive. I appreciate your detailed review, I call it that because you seem to have a talent for eloquence. Thanks for the nice words. You are right to nitpick, I agree the basketball board should have been red and the idea was to put a trash can underneath as it is obviously too low for actual basketball. The notch on the skateboard didn't bother me, I thought it made a sort of transition, but I got a similar comment from mr. Kram about a half-plate gap on one of my other models, so I might have to work on my perception of acceptable tolerances. I hope to meet you in a future contest. But it has to be a topic I dislike. Something like cough!astle. In addition the bicycle, the lamp, the chair and the Getthoblaster! Unbelievable how you built it! A great Entry that is bringing back the BMX-Days! The T-Shirt Design is really great and I like the Walkman. Thanks Larsvader, I didn't know Ghettoblaster was a word before LEGO made the little minifig box and that was in the official name. Tnx. Fletcher Floyd, well spotted.